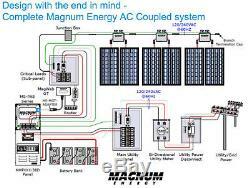 MAGNUM ME-MGT500 DUAL MC4 INPUTS MICRO-INVERTER 500W 240VAC GRID TIE SOLAR POWER. 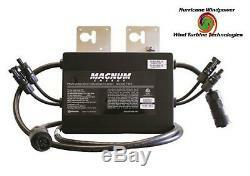 Magnum Energy 500 Watt Grid-Tie Microinverter ME-MGT500. Set up your Grid Tie Solar Power System today - and be ready for Battery Backup later! With the Magnum Energy MicroGT 500 Microinverter , you are able to install 2 solar panels per inverter, reducing installation time, and saving on overall system cost. The microinverter has an individual MPPT for each panel, and can handle up to 310 watt panels, with minimal clipping, delivering 250 watts AC per module. And as with any microinverter, the module level electronics mitigate shading issues and increases overall system production and reliability. 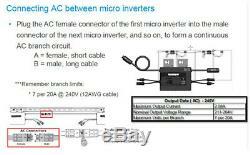 What's UNIQUE about the MicroGT 500 Microinverter? With the 2:1 PV Module ratio, you need HALF the amount of inverters required for the job! Daisy-chain connection of microinverters with integrated AC and DC connections - no trunk cables required! (See AC and DC Connection Diagrams in our images). These micros are Storage Ready - AC couple them with Magnum MS-PAE battery based inverter allowing the addition of batteries to your system when you're ready! Wider active harvesting range for MPPT tracking voltage! Less points of failure, less labor, and less overall cost/watt! Connect up to 14 solar panels per string, using just 7 GT500 Micros (w/a 20A breaker). Works with 60 and 72-cell modules. UL Certified (UL1741) and Rapid Shutdown compliant (NEC690.12). MagWeb GT Communication Unit (optional - but highly recommended) provides unified display of microinverter production, PAE, and battery status. Additional copper grounding wire will be needed, in connection with the Micro GT's grounding lug, to ground the system. Or a WEEB may be used between the racking and microinverter. AC Branch Connection Cable has female connector at one end and bare wire at other to connect the junction box to the first microinverter. Weatherproof protective endcap for capping the end of the branch circuit on last microinverter. No diversion controller needed for loads - the MicroGT is optimized to taper charge on the batteries, and prevent them from being overcharged. It will slowly back off charging as the battery fills, and turn off when the battery is full. The AC Coupled Support mode is a control method that causes the output frequency of the MS-PAE battery-base inverter to decrease - causing the output power of the Micro GT grid-tie inverter to decrease, in an attempt to maintain the battery voltage around Absorb voltage. The AC output of the MS-PAE battery based inverter should be greater than the potential array AC output. Any product you return must be in the same condition you received it and in the original packaging. Magnum Energy 500 Watt Grid-Tie Microinverter ME-MGT500 Set up your Grid Tie Solar Power System today - and be ready for Battery Backup later! With the Magnum Energy MicroGT 500 Microinverter, you are able to install 2 solar panels per inverter, reducing installation time, and saving on overall system cost. The item "MAGNUM ME-MGT500 DUAL MC4 INPUTS MICRO-INVERTER 500W 240VAC GRID TIE SOLAR POWER" is in sale since Friday, September 15, 2017. This item is in the category "Home & Garden\Home Improvement\Electrical & Solar\Alternative & Solar Energy\Chargers & Inverters". The seller is "hurricanewindpowercom" and is located in Roanoke, Virginia.